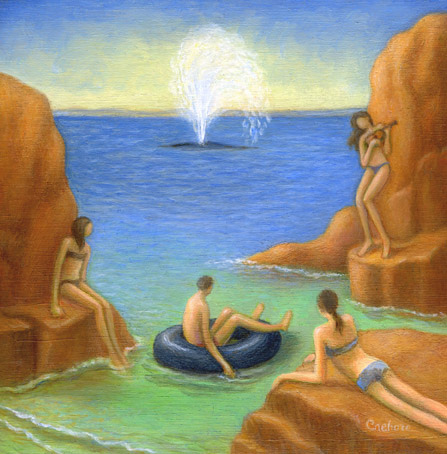 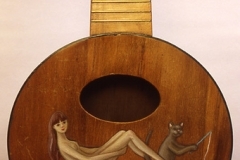 All-but-naked pixies cavort with cigarette-puffing kitty cats. 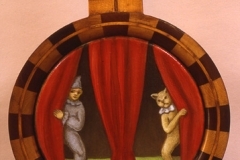 Adolescent clowns linger behind half-opened curtains. 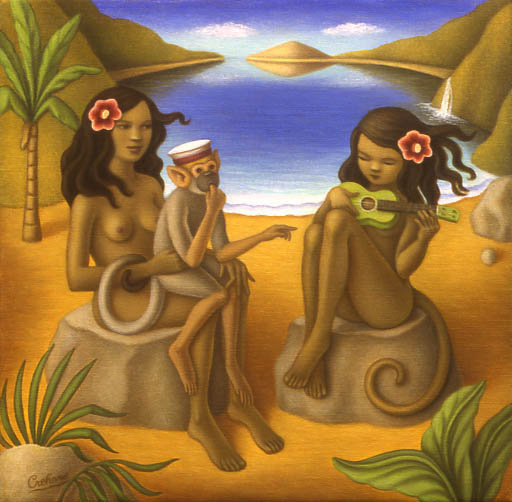 Ever-present monkeys lounge lasciviously all ‘round. 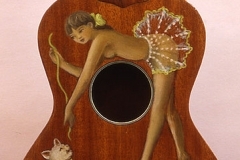 Hers is an intuitive palette of personal archetypes reaching out to a larger audience – on the fronts and backs of the smallest of stringed instruments. 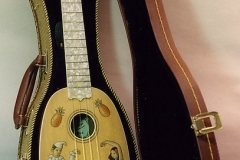 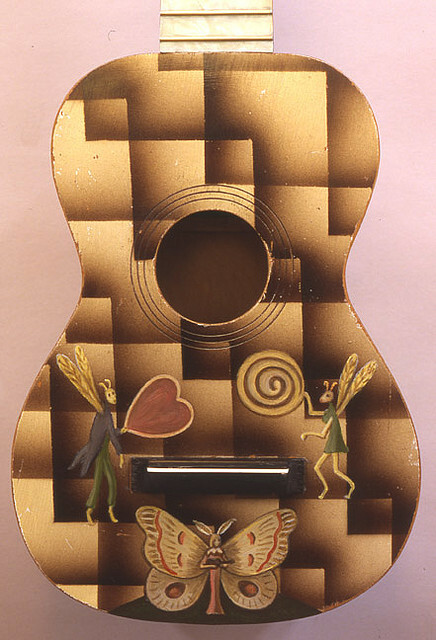 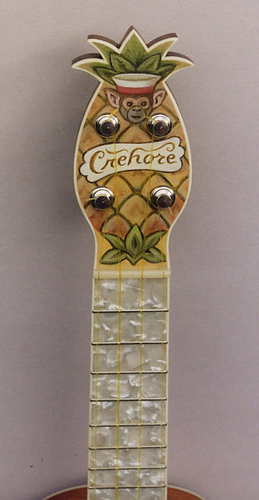 Before she painted any of her collection of ukuleles, dating from 1919 through the early 1950s, each was restored by her husband, luthier Lou Reimuller. 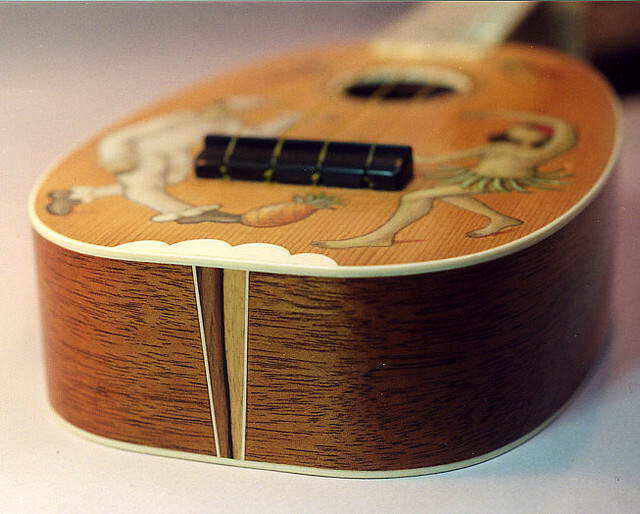 Using Crehore’s designs, Reimuller also creates new instruments from scratch, out of mahogany and spruce. 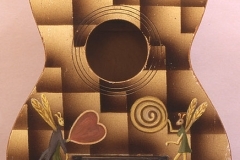 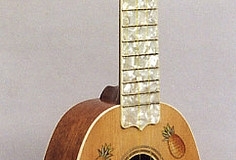 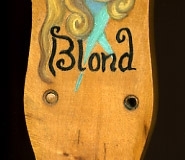 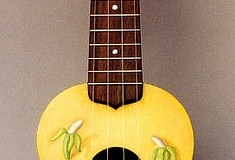 For “Tickler Uke #2,” he incorporated an old ivory piano key into a white cloud inlay, and added a fret board made of pearloid (known also as mother of toilet seat). 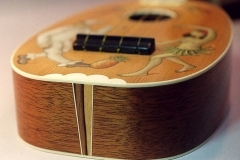 “We’re making one-of-a-kind things with unique features that are hand-crafted,” she says. 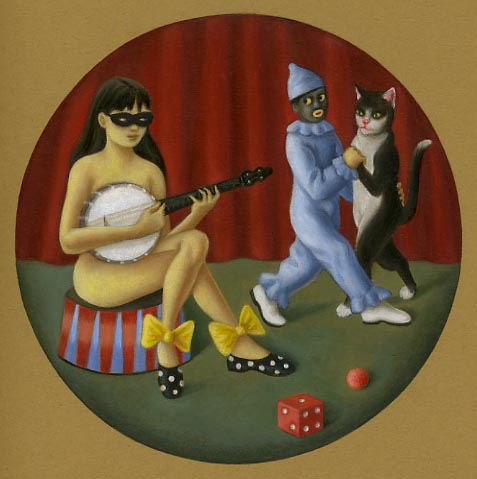 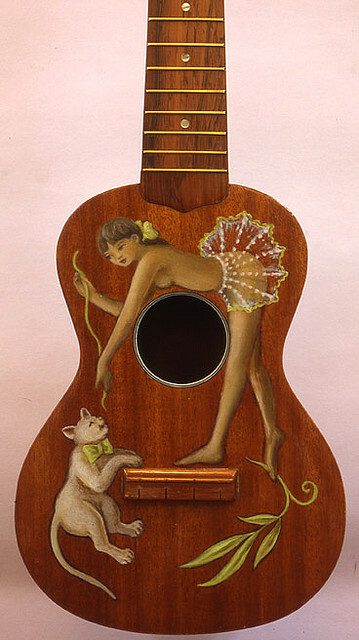 For a 2009 gallery exhibition, she hung 13 painted ukuleles in between as many of her oil-on-linen paintings. 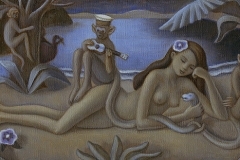 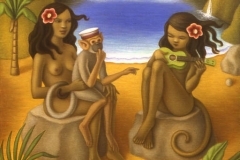 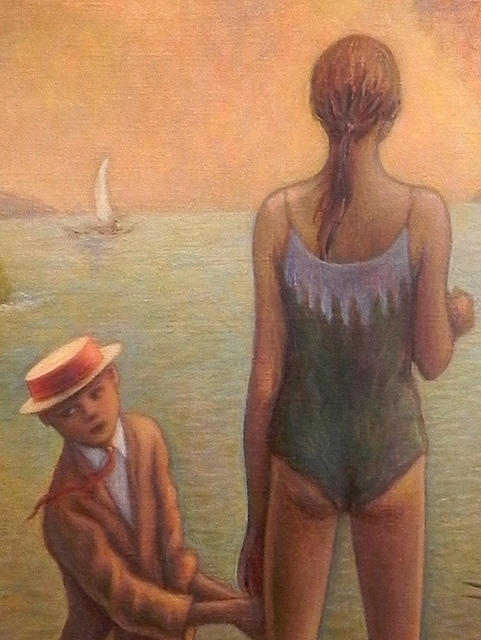 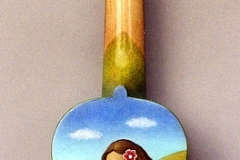 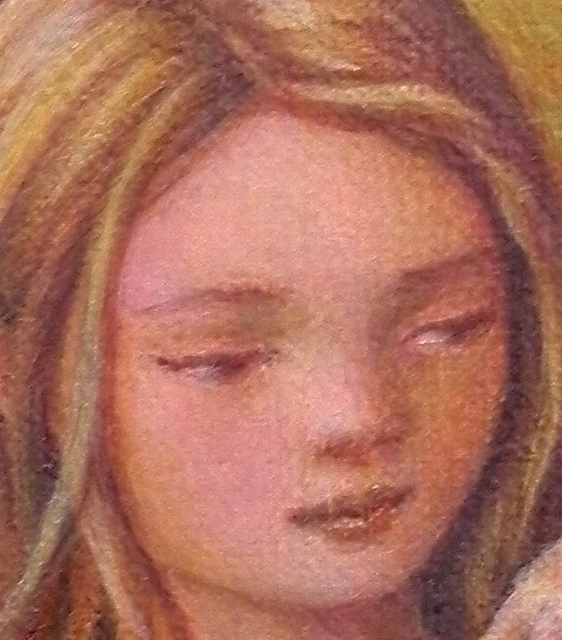 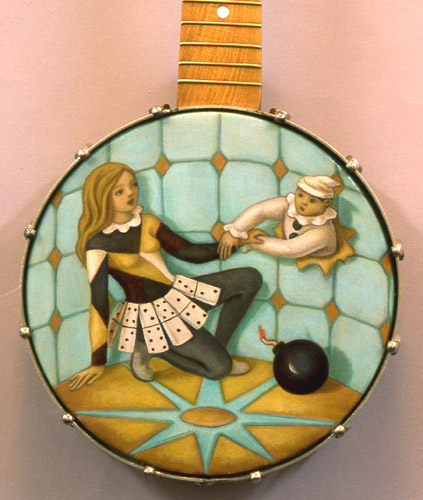 Some of the paintings on the ukes echoed images in the paintings, while a number of the paintings featured the ukes. 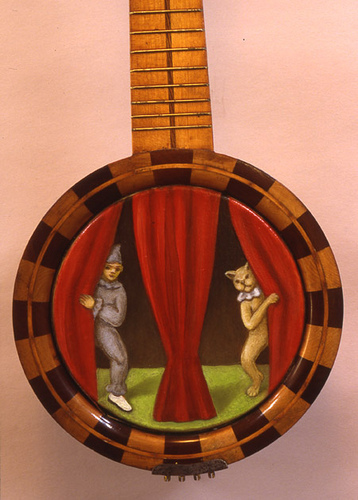 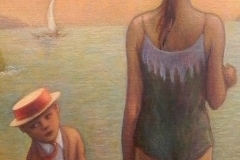 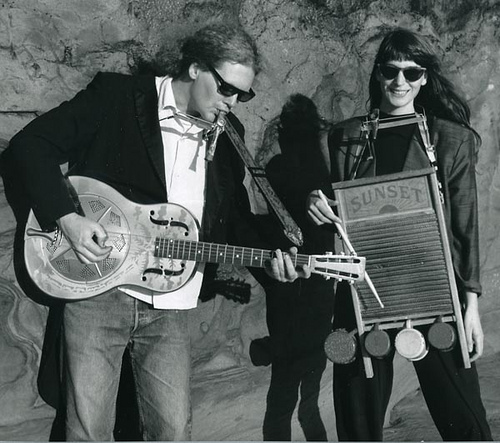 Reimuller assured that all the instruments were playable, and the couple – whose “Hokum Scorchers” band plays 1920s and ‘30s jug band music – performed at the exhibit. 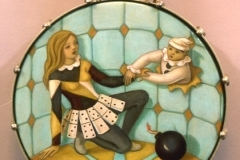 And she has quite the eye – one she says shows relationships between characters that evolve mainly out of a picture’s composition and design. 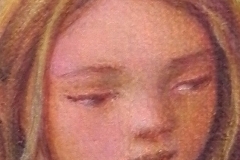 They do resonate with the public, though. 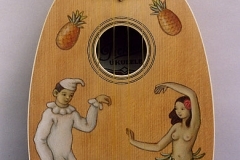 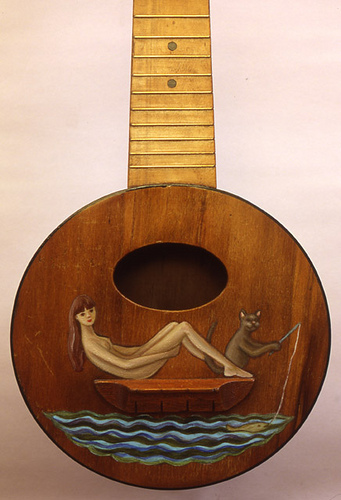 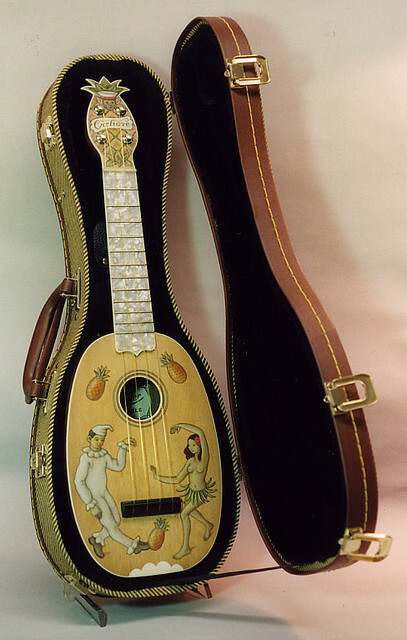 After two years in the making, “Tickler Uke #2” quickly sold for $3,600. 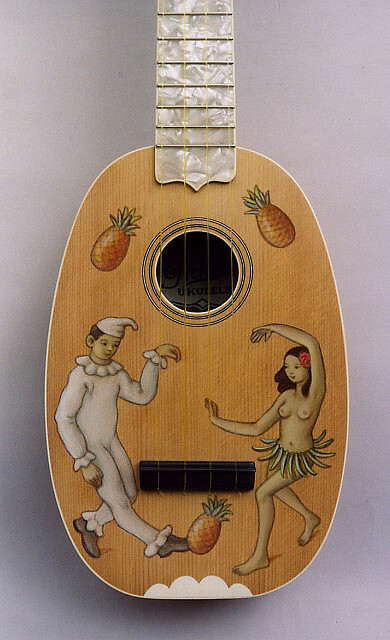 So stand by: “Tickler Uke #3”, a larger concert model, is nearly finished.